Help-U-Sell Real Estate has launched a new tool that provides home buyers and sellers real-time information about their local real estate markets. Called Market Sketch, the tool uses local Multiple Listing Service data to display statistics such as median list prices, average square footage, days on market, and total inventory for the selected city. 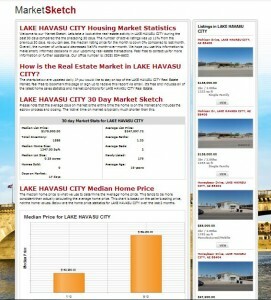 Users can also choose to view statistics by property type, including land, multifamily and single-family. Once enough data have been collected, users will be able to customize the time frame. Charts compare the number of properties sold per month and the median price per square foot, among other facts. Help-U-Sell Real Estate's new Market Sketch tool displays real-time local real estate information, including days on market and total inventory. In addition to graphs and charts, written sections explain the status of the local real estate market. Brokers can personalize certain elements, and the office’s contact information is included. Brokers will be able to send the information to their buyers and sellers via a direct link, and users can register to receive their local Market Sketch via a monthly email. If the broker wishes to use Market Sketch as a lead-generation registration tool, he or she can opt to require registration before a user can view the most recent statistics. The broker’s current listings are displayed in the right-hand column to encourage users to browse properties for sale. Dynamic interest rate charts, and daily mortgage and interest rate news show up below the current listings. See an example of Market Sketch on Help-U-Sell Honolulu Properties’ site.